Rhode Island offers some of the finest luxury rental properties in the country. Each Rhode Island vacation rental shown on our site has its own unique charms, luxurious amenities, and high end finishings. Let us find exactly the right luxury vacation rental for you. Call (401) 680-6588 for a personal consultation. Champs Soleil evokes the opulence and elegance of Newport's Gilded Age. Imported 18th century gates open to reveal this magnificent home, completed in 1929. The park like grounds include specimen trees, sculptures and one of the finest croquet courts in the US! The living space totals fourteen thousand square feet including a one thousand square foot living room with twelve foot ceilings, a ballroom, a library with imported French walls, ceilings and floors and a chef's kitchen with multiple pantries and a dining room for twelve. 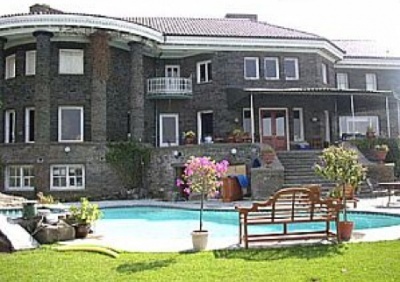 The estate accommodates 10 comfortably with five luxurious bedrooms. Architects Polhemus & Coffin modeled Champs Soleil after La Lanterne. It is located on Bellevue Avenue near Marble House and Clarendon Court. If you're looking for an exceptional vacation experience, consider luxury waterfront homes and estate properties for rent. Rhode Island summer homes such as Champs Soleil, The Windmill at Hammersmith Farm, and Beacon Rock, are among the finest luxury summer rental properties on the east coast. Scroll down to browse luxury Rhode Island vacation rentals, read more about individual luxury vacation rentals, or visit our rental search page to view all rental properties currently listed. Renting the The Windmill at Hammersmith Farm is like stepping back in time. 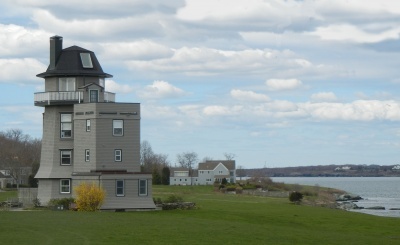 It is an iconic landmark overlooking Newport Harbor near Ft. Adams. In the 1960s it was a part of the Auchincloss estate which served as President and Mrs. John F. Kennedy's summer White House. Jacqueline Bouvier Kennedy Onasis spent many happy summers here as a child, and the structure remains much the same today as it was during that time. The views are spectacular across the Bay toward Jamestown to the west, toward Newport Harbor and bridge to the north and the open ocean to the south. Beacon Rock is situated on a huge promontory that towers over Newport Harbor offering incredible elevated views of the Bridge, Harbor, downtown, Fort Adams and Jamestown. The property has over two thousand feet of water frontage on Brenton Cove and Newport Harbor. Once the home of Felix deWeldon, creator of the Iwo Jima sculpture, the imposing McKim, Mead and White mansion has a grand central courtyard with classical colonnade. There are six large bedrooms and three smaller ones with ten full baths and one half bath. The twenty-two thousand square foot structure was restored in 1997. A pool with unparalleled views of the harbor and bridge was added a few years later. A twelve-foot, deep-water dock, a fifty-foot sailing yacht, and sixteen-foot tender are also available for rent. There are 11 fireplaces, a formal reception room, a fully equipped chef's kitchen, staffs quarters, a marble spa, billards room with the finest finishes and materials described more fully here. For a tour of Newport homes for sale, contact us online or call (401) 845-9500 to speak with a Newport REALTOR® at Hogan Associates. Hogan Associates is made up of experts and specialists in each phase of getting your home sold. From photography, to online marketing, to transaction management and closing... we have built a tbrokerage of the best professionals in the Rhode Island real estate market. You can trust us to be YOUR REALTOR®. We have the right tools, the best people, and are backed up with the best information to make selling your home as successful as possible.